Registry problems can slow your PC to a screeching halt. 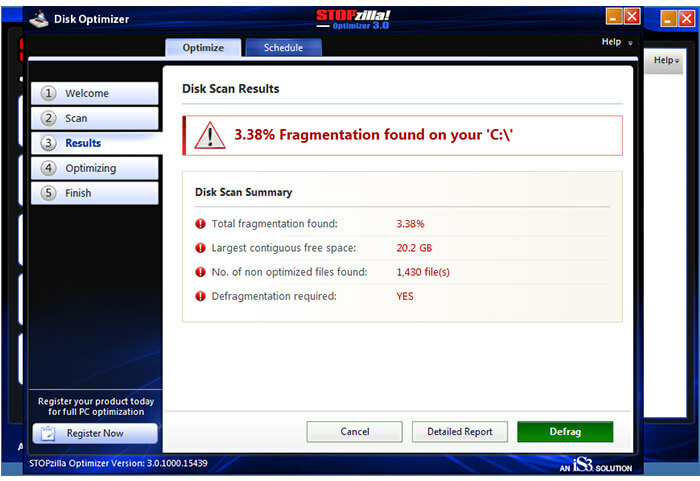 With one click, STOPzilla Optimizer will scan your registry for fragmented files and fix them. With one click you can fix invalid application paths and clean your PC of uninstall information, COM/ActiveX objects, help files, file extensions and font files. STOPzilla Optimizer allows advanced users who want more configuration control to manually make changes to the registry. STOPzilla Optimizer's Registry Backup lets you save registry information for later use. Use System Backup when you want to perform a rollback of your Windows operating system. We stand behind our technology with free, unlimited customer service. Any problem with our products can be resolved free of charge by e-mail, website, or phone. If you are suffering from slow PC performance, computer cleaning software may be able to help. 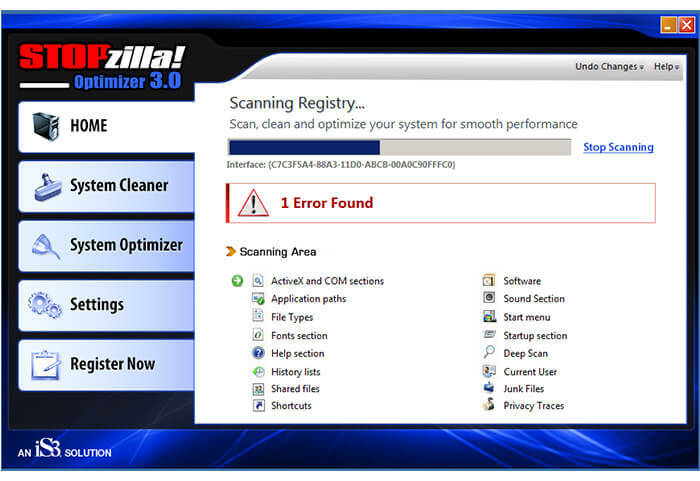 STOPzilla Optimizer is a multi-featured registry cleaner, supported in the United States, that can help keep your Windows computer running at maximum speed. 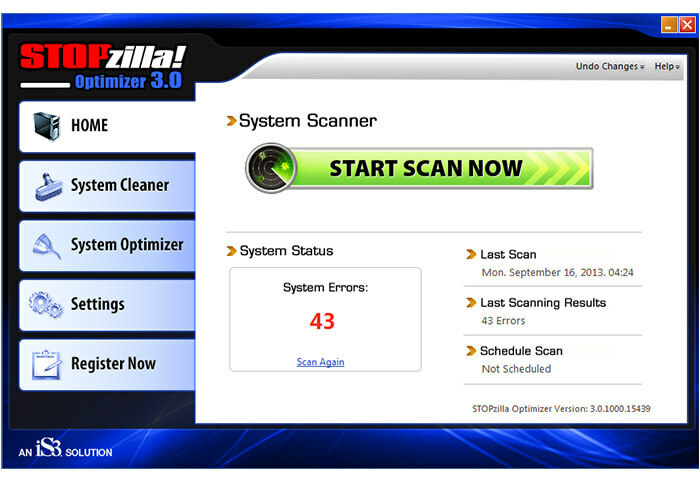 Far from your standard PC optimization software, STOPzilla Optimizer has tools for beginners and power-users alike. Clean up your computer with only one-click using Automatic Repair. Need to make manual changes to the registry? Use Advanced Repair for full control in an easy-to-use interface. 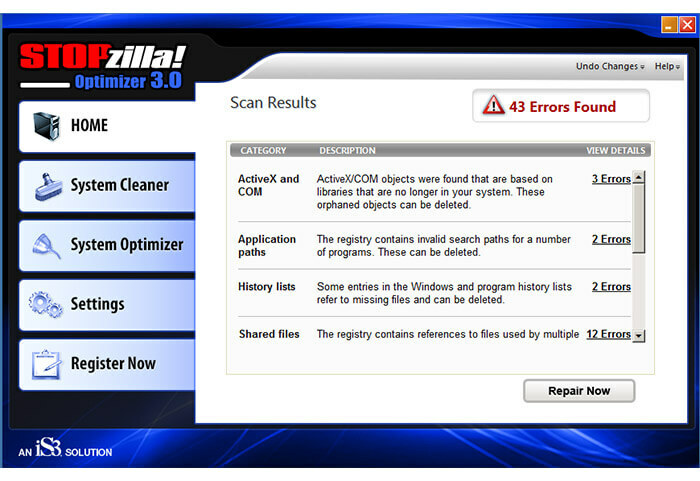 More than just a computer cleaning software, STOPzilla Optimizer also allows you to backup your system and registry so you can roll back the operating system as needed. 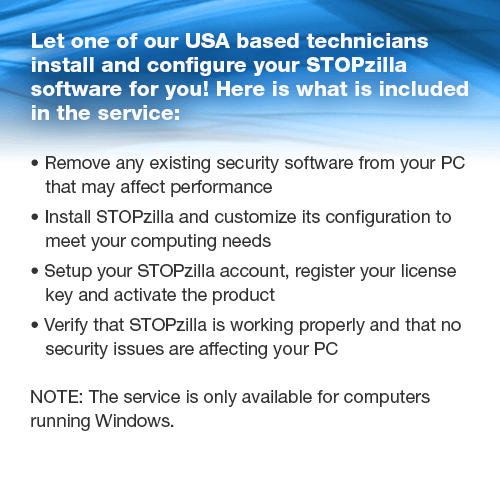 If you ever have questions about running our PC optimization software, STOPzilla Support is here to resolve any issues. At STOPzilla we are committed to providing the best possible products and services to our customers. This is why we offer a 100% money back guarantee. If you are not completely satisfied with our service or programs, we are not satisfied. Initial subscriptions can be refunded within 30 days of your purchase. Renewals can be refunded up to 60 days of the renewal date. No questions asked. To request a refund, please contact a billing representative via the following methods. I was on the verge of buying a new PC because it was running so slow. I used to have to wait about 5 minutes for my PC to boot up and another minute in between web pages! I couldn't run more than two programs at a time without it freezing. I saw STOPzilla Optimizer and tried it out. 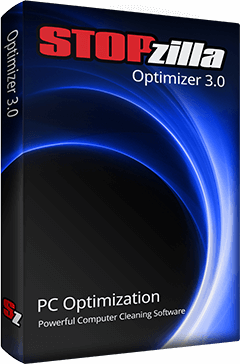 I have to say STOPzilla Optimizer will always be one of the first programs I will ever install on my computers in the future. It saved me from having to buy a new computer—this one runs like new. As a PC gamer, speed means a lot to me. Manual optimization can only do so much, and messing with the registry is too risky. I love STOPzilla Optimizer because it cleans out my computer regularly, updates my drivers and keeps my frame rates high, giving me an edge on the competition.